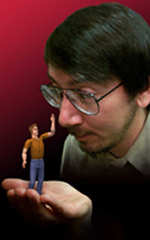 Will Wright, Maxis’ Chief Designer, co-founded Maxis in 1987. Wright began working on what would become SimCity—The City Simulator in 1985. SimCity was released in 1989, and has since won 24 domestic and international awards. Wright co-designed SimEarth—The Living Planet in 1990. In 1991, Wright co-designed SimAnt—The Electronic Ant Colony. SimCity 2000 and SimCopterare also part of Wright’s recent repertoire. SimCity 3000 Unlimited, the definitive version of 1999’s best-selling game SimCity 3000, continued in the tradition. The long-awaited 4th generation, SimCity 4, was released in January 2003. SimCity 4’s first expansion pack, SimCity 4 Rush Hour, and SimCity 4 Deluxe Edition were shipped in September 2003. Wright’s ground-breaking game The Sims, puts players in charge of the lives of a neighborhood of simulated people. Released in February of 2000, this wildly popular title has become a cultural phenomenon. The Sims has inspired six expansion packs. Livin’ Large, House Party, Vacation, Unleashed and Superstar allow players to put their simulated families into new extreme situations and settings. The final expansion pack, Makin’ Magic, was released in October 2003. Taking its bow in December 2002 was Wright’s much anticipated The Sims Online™, which was featured in a cover story in Newsweek Magazine. The next generation of The Sims PC products debuted in September 2004 with The Sims 2, which became the fastest selling PC game ever selling more than a million copies in the first ten days worldwide. In 1999, Will was included in Entertainment Weekly’s “It List” of “the 100 most creative people in entertainment” as well as Time Digital’s “Digital 50”, a listing of “the most important people shaping technology today.” In 2002, he was #35 on Entertainment Weekly’s Power List. Will is currently devoted to the creation of Spore™, which took home the Electronic Entertainment Expo’s most coveted prize, the Game Critics Award for Best of Show when it debuted at E3 2005. Spore was also named Best Original Game, Best PC Game, and Best Simulation Game.